The high price tag of the 17-hour spectacular was due to having one glass palace, two venues, two receptions, two dresses, three wedding cars, two photographers, two videographers, three florists, but fortunately the couple have two multi-millionaire sets of parents who could help cover the cost. The porta-palace glass marquee is believed to be the most expensive marquee available in Europe, costing £250,000, with the air-conditioning estimated to have cost £50,000 and the blossom trees to decorate it costing £31,500 on top. Being hosted at the Middleton’s family home and with over 350 guests expected, a super-sized luxury marquee was needed. Whilst a luxury 350-person marquee will start at £25,000, Pippa’s porta-palace was a completely different league and the most expensive marquee option you can hire. The marquee required a huge reinforced structure for it to sit upon, plus two additional supersized marquees, and road tracking. On top of this, from talking to leading specialists, the glass marquee would have required huge generators to power extensive air-conditioners to stop the glass house overheating and this is expected to have cost £50,000 on the air conditioning alone. This marquee is only available from Belgian company PBI, whose team would have transported the marquee from Belgium, adding significantly to the cost. The effect of Brexit will have meant the weak pound will have likely added £30,000 to the marquee bill alone. The evening reception was held at Bucklebury Manor – the stunning home of Pippa’s parents, overlooking rolling fields and British countryside, so fortunately had no charge, but will likely need some time for their croquet lawn to recover. The highest quality mobile toilets from top providers will cost £4000 to cater for 350 guests. Pippa and James will have paid the church their marriage fees, but whilst this is the most important part of the marriage, it had the smallest price tag of all. To hire a luxury country house will cost around £20,000 for two-days over a summer weekend, including Friday night accommodation, where Pippa stayed, plus an evening dinner, plus the Saturday wedding reception. During the 2-hour wedding reception, the 150 guests would be expected to eat 5-canapes hour per hour. These 1500 luxury canapes alone would cost around £6000 , but with serving staff, linen, crockery, chefs and decoration on top, the likely cost was £14,000. Guests would be expected to drink 2-glasses of champagne per hour. This equates to 50 magnums of Ruinart Blanc de Blanc at £120 per magnum, which was the champagne of choice, so £6,000, plus some soft cocktails on top. The luxury caterers Top Table, would charge over £170 per guest for catering including all food, chefs and staffing, glassware and crockery hire, and linen hire. With it being a marquee wedding, an extra level of staffing would have been required to look after the 350 guests ,than at a venue, so it will likely be around £200 per guest. The evening food stations of hand carved serrano hams and parmesan, would be add an additional cost on top. Around 233 bottle of champagne will have been drunk by the guests during the evening drinks reception and speeches. Nyetimber 2010 Blanc de Noir Millington was said to be served, at £75 per bottle, costing around £17,475. On top of which fine wines for the dinner (around 200 bottles), and cocktails until 4am to be added. Giles Deacon designed Pippa’s bespoke designer dress. Giles previously designed Abby Clancy’s stunning wedding dress for her marriage to England footballer Peter Crouch which cost £10,000. Top London couture designers estimate the dress would have cost £38,000. With the overflowing flower arch of the church, the huge displays at the church entrance, and every pillar and pew bursting with flowers within the church, luxury florist Lavender Green Flowers’ bill for this will likely have hit the £10,000 mark. Lavender Green Flowers also decorated Engelfield House for the reception. The likelihood of the church flowers ‘look’ being carried through is high, so this will likely have added on another £6,000. Pippa’s second luxury florist of the day, Djordje Varda was flown in from St Barths to work with yet another celebrity florist, Rob Van Helden, to bring the 350ft glass palace to life. The Middleton family paid for the wedding and ceremony whilst the Matthews family paid for the evening reception, hence the different florists and teams. Each of the 35 table centres were filled with perfect blooms as was the rest of the marquee, Bridebook.co.uk luxury suppliers expect £32,000 would have been spent on the marquee floristry by these top florists, not including the blossom trees…. Dorset-based Millie Pilkington was the wedding photographer as Bridebook.co.uk was first to predict. Millie was the private wedding photographer for the William and Kate’s wedding also. Just like Pippa had two venues, she also had two photographers with luxury wedding photographer Matt Porteus also shooting the day. A top wedding photographer, including a gorgeous album, will cost around £3,500, but with additional photographers to cover 350 guests and two venues and very long day, it could likely be even more. 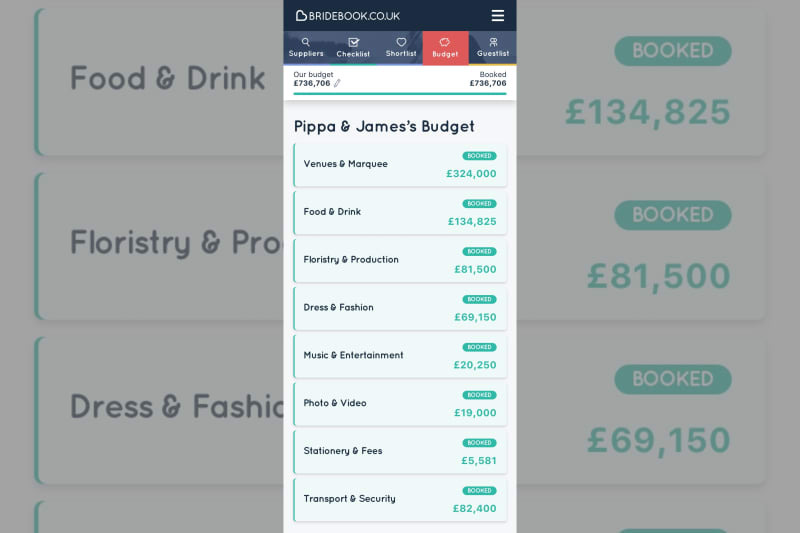 Just like Pippa has two photographers, Bridebook.co.uk can reveal she also had two videographers, James O’Garra of Jim & Tonic Films and an award-winning German filmmaker and director Patrick Gather. Keep your eyes peeled in this years Oscars for this high-budget production. A stunningly-decorated cake from a top cake maker will start from £2,600 and need to be six-tiers to give a slice to each of the 350 guests. The cakemaker is thought to London-based Domino Purchas. From Save-the-dates, to the full invitation, to the Order of Service, to menus, and don’t forget the stamps! Stationery from a top stationer will cost around £11 per invitation alone, such as Mount Street Printers who are rumoured to be the chosen wedding stationer. Luckily they saved on design costs as a drawing by the Duchess of Cambridge was used on the Order of Service. From bells ringers and the organist, to Jazz trio for the ceremony reception at Englefield House, to acoustic musicians for the evening reception, to the wedding band, to DJ and saxophonist for the party, Pippa has it all. A top London 5-piece wedding band will cost over £3,000 with everyone else on top. Celebrity milliner Stephen Jones designed Pippa’s stunning bespoke veil which likely cost £2,000. Pippa had a top team on hand to ensure she was looking absolutely radiant. Celebrity hair stylist Pol Garcia did her hair. Hannah Martin of Bobbi Brown, who also did Kate’s wedding makeup for the Royal Wedding, is rumoured to have done her makeup. Pippa wore a Manolo Blahnik pump, in an ivory satin with bespoke pearl detailing which cost £2,000. Their wedding rings are said to be from Robinson Pelham. Both James and Pippa opted for simple gold bands, more understated than expected, but following suit of the Queen and the Duchess of Cambridge, which will have costed around £800 each. With Prince George was centre stage in his Pepa&Co bespoke outfit along with his 3 fellow page boys. The catalogue items are £350 each, so for fully bespoke they were likely £600 each. The average number of bridesmaids a bride has is 3.4 in the UK, so Pippa’s three mini-bridesmaids, including Princess Charlotte, were perfect. The Pepa&Co catalogue items are £520 each, so for fully bespoke they were likely £800 each. Dashing James Matthews wore a bespoke tailor made tailcoat, waistcoat and trousers. A bespoke tailcoat from a top tailor will cost around £4400 alone. His Edward Green shoes were £900. A new tailored dinner jacket and trousers for the black-tie evening reception would have cost another £3000 from a top tailor. With two venues, two photographers, two videographers and two wedding cars, of course Pippa had to have two dresses. Believed to have also been a Giles Deacon creation estimated at £6,000. Pippa’s brother James came to the rescue with 350 custom marshmallows from his company Boomf. We hope he didn’t charge for them. With screens and speakers in the church, as well as production for Englefield House, including a platform built for Michael Middleton’s father of the bride speech, production would have likely be £6,000 between both. The Matthew’s family flew in their production team from St Barths along with London experts Starlight, whose incredible lighting and production could be seen miles away across the valley. With a vintage Jaguar for the bride to arrive with her father, and another for the pageboys and bridesmaids, each would cost around £1200. The Jaguar E-type, which is the oldest surviving of its type, would have likely cost £5,000 for such an incredibly rare car. From a spitfire flyby (£4000), projections mapped of the the happy couple on top the family home (£5000), a photobooth (£1500) and table tennis (£1000), the guests had plenty to amuse themselves with. Guests were transported in 50 Range Rovers. A full-day hire with security vetted chaffeurs will have cost around £900 each. With royal guests, Hollywood stars, and sporting legends, security at the event was extremely tight. Whilst much of the security would have been provided by the police at no charge due to the Royal guests, an additional £30,000 of private security is estimated to have been on hand. Venue Hire: £5,819, Marquee: £4,413, Catering: £4,787, Wedding Dress & Accessories: £1,329, Photography: £1,211, Rings: £1,058, Videography: £1,056, Music Entertainment: £941, Flowers: £777, Venue ‘Dressing’: £723, Other Wedding Outfits e.g. bridesmaids: £625, Menswear: £577, Non-Music Entertainment: £520, Transport: £470, Hair & Make-Up: £337, Wedding Cake: £318, Stationery: £290 and Other: £1,779. For more details of this year’s wedding trends and spending habits analysed by Bridebook.co.uk, view the Bridebook.co.uk Wedding Report 2017.